Hathi is born of three great loves – doodling, clothes and elephants! Hathi appeals to the free spirit in every woman. Our designs are deliberately simple with playful cuts and silhouettes guaranteed to add a punch to your wardrobe and a spring in your step. All our prints are hand drawn sketches of the leading star casts of elaborate stories concocted in our heads. The styles correspond to the ideas behind the sketches so the finished pieces are complete stories that get told when you wear them! 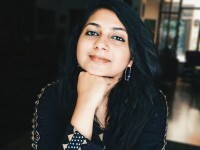 Founded by Anjani Prakash, a Delhi based marketing consultant, Hathi is her creative outlet. Passionate about stories, art and fashion, she found the perfect outlet in Hathi... creating stories through a constant play of doodles, fabric, cuts, styles etc. Hathi appeals to the free spirit in all women...that ever so often gets hidden behind the mundane humdrum of everyday life. All pieces are made to order and will be shipped in 3 Weeks time and we would keep you posted about the approximate delivery date. These delivery times are subject to location, distance and our logistics partners. We are not liable for any delays in delivery by the courier company/postal authorities but will help you track down a package through our partner courier services. All Hathi pieces are made with the utmost love and care. If for some reason, you are unsure of the size or we’ve missed a spot and you’d like to exchange them, you can write to us and we will contact you within 1-2 business days and will guide you through the process of returning and exchanging pieces. You must inform us within 7 days of delivery of the product. Hathi reserves all rights to inspect the condition of the product before processing any returns or exchanges.